The Monaco GP was not the best one so far, as far as Honda getting some results is concerned. 3 Out of 4 Honda powered cars did not reach the finish. JV had a bad start (clutch problem), Sato crashed into the wall (in the tunnel while trying to let Fisi pass), and Panis got hit by a rocket named Button (trying to pass him while driving 15 meters behind him). Fisi DID finish, and finished in the points, at the 5th place, getting 2 points for Jordan. BAR still has no points this season, the only team that has no points to be precise. Trulli's 4th place is still under investigation, the FIA is investigating engine software on his Renault. This will take two days. When he will be DNFed, Fisi will move to 4th position! We'll keep a close eye on testing this week. If the rumoured Step2 engine is going to be used in 2 weeks (Canada), the Jerez test of BAR will not be the only test where we will get a feeling of this new engine. The BAR004 will also get quite a lot of new aero and mechanical upgrades. And this time we will hopefully have some more info and times to report. 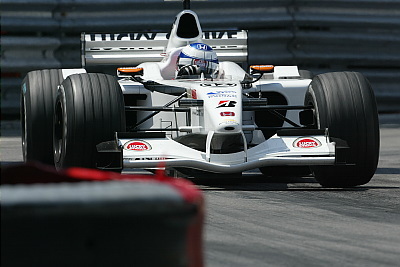 JV drove the BAR004/07 chassis, and Panis used the BAR004/08. 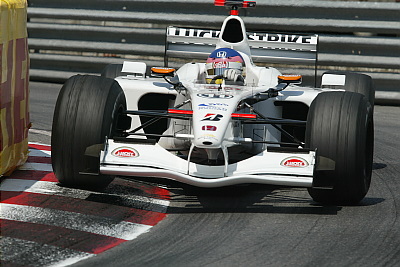 The 2002 Monaco Grand Prix was brought to an abrupt end for both Lucky Strike B.A.R Honda drivers Jacques Villeneuve and Olivier Panis today. Jacques' race was compromised before he even made it off the grid when a clutch problem caused his car to stall. He delivered a committed drive in an attempt to salvage something from the race but was forced to pull off on his 44th lap. Olivier made a good start and steady progress in the race but with his first finish of the season well within his sights, a coming together with Button spelt the end of another frustrating Grand Prix weekend. "I had a good start and managed to move up to 16th at the end of the first lap. We had a one-stop strategy and this could have worked out for us. The car was running well and I didn't have any problems, so everything was on target until Button hit me while I was braking and turning into St Devote. I didn't see him coming and you don't expect someone to overtake there. It was a racing incident though so we need to forget about it and focus on preparing for Canada." "We had a problem with the clutch at the start and lost everything because of that. By the time we started the car I was obviously a lap down, but only half the cars finished the race today so you have to be there and keep pushing." "It was a shame because we had a strategy to pit very late and even with all the fuel we had on board we were doing very competitive lap times. The tyres were also holding up very well so we could have had a good race, but the car suddenly developed a problem and I had to pull over. Good luck hasn't been on our side again here so we have to hope for better things in Canada." "From 14th and 18th on the grid this was never going to be an easy race. However, as we've seen in the past, Monaco is often full of incidents and we needed to be in a position to take full advantage of these should they occur." "We were running a very long strategy which would have seen us pitting late in the race but unfortunately, with neither car going much past the half way mark, we'll never know what would have been." "Our aero update kit, revised gearbox and new Honda engine will be available for Canada, albeit with only a very short amount of testing this coming week. So, we're looking forward to Jacques' home event with a certain amount of optimism." "I'm happy that we've scored points for the second race running. Giancarlo and the Jordan Honda team did a good job today. The reality is however that only one of the four Honda-powered cars made it to the end, so we can't feel at all satisfied with the overall result. Takuma and Olivier both retired before their scheduled pit stops so we didn't get a chance to see how well their race strategies would have worked. Jacques had a tough day as well and didn't really get the opportunity to show us what we know he can do."